This was awesome on the stream! I enjoyed every second of it. Well done gaspode. great idea! So. Very. Wonderful! My favorite gaspode so far. How to get Amigaaaaaaaaaaa-fans vote! Brilliant effect, pulled off flawlessly! This was beautifully done, seen similar stuff done before but not as well as this. Would make an incredible installation piece. Awesome. Obviously a crowd-pleaser, but so cleverly done that I can't help but lift my thumb! Very enjoyable and nice soundtrack! simple but good idea - and great execution! Hah, excellent! Nice idea and execution. Astonishing. Standing in ovation. Thank You for the show. Awesome! And definitely the best Amiga you could choose! Wow, really well done, very moody sound/feeling. Brilliant concept, very well executed with a great soundtrack too. Has a great feel and pace too. Just brilliant and a well deserved winner. I thought it is fully rendered, but still very nice concept, highlight of the party. Magic indeed. 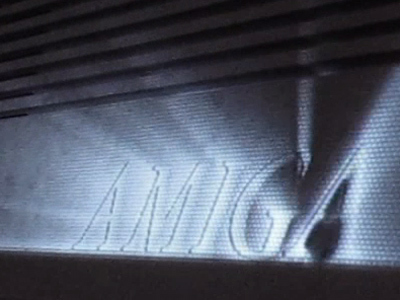 I have absolutely no sentimental attachment to Amiga, yet enjoyed this massively. Great idea and very nice soundtrack, thank you very much. Technically impressive, but looks too much like an advertising for the Amiga. Maybe, if I were an Amigaist, I would have liked it more. Your best prod yet. The source video used on the projector may get even more thumb action. also....AMIIIIIGAHHHH!!1! @luis: I don't think so. The pure projection looks rather uninteresting without the amiga under it. I love love LOVE the soundtrack in this prod! And obviously the visuals are very nice too, what a brilliant idea gaspode! best non-professional projection mapping i've seen so far. brilliant ideas and awesome soundtrack too! A bit too much of an Amiga whoring crowd-pleaser for me, the really nice effects would have worked with a different theme as well. But it is really well made and the music is great so I still enjoyed it which means the thumb goes up. rulez added on the 2014-04-28 22:43:29 by JAC! I liked your stuff so far a lot. But this is your best work yet! Deserved Winner! rulez added on the 2014-05-01 22:13:25 by ɧ4ɾɗվ. amazing soundtrack, nice idea and near-perfect execution. one of revision's highlights. All around great, I truly enjoyed it on the bigscreen. Great music, great visuals, fantastic idea, cool ending - even my non-scener wife liked it! Thumb up for the idea and the great music! Would have been better as a hardare mod rather than a well crafted yet still boring video. @T$: What is a »hardware mod«? Man, when I loose the faith or motivation, I always run this one. Really, it's a medicine. A500 4evah! Thx for this. Nothing changed, I still LOVE this one :) Thank you Gaspode! page created in 0.021470 seconds with 15 queries.